Electromagnetic wave are produce by accelerating charges. In this lab, you will also use an on-line simulation from the University of Colorado PhET group to study the production and propagation of radio waves produced by accelerating charges in an antenna. All waves diffract, if they pass through or around obstacles, and interfere, if two or more waves arrive at the same place at the same time. When a monochromatic plane wave passes through a single slit of the right width w, we observe a Fraunhofer single slit diffraction pattern a large distance L >> w away from the slit. When the wave passes through multiple regularly-spaced slits with slit-spacing d, we observe a multiple-slit Fraunhofer interference pattern a large distance L >> d away from the slits. In this lab you will also use Excel to produce some plots of diffraction and interference patterns for electromagnetic waves. Open a Microsoft Word document to keep a log of your procedures. This log will become your lab report. Address the points highlighted in blue. Answer all questions. Click Help to make sure you are aware of all controls. In manual mode try to move the electron with constant velocity. What happens? Make the electron start and stop rapidly. What happens? How is the radiation field produced? (a) Set the transmitter movement to oscillate. This is how radio waves are broadcast. Display the radiation field and explore the various field type and field sense displays. Then settle on curve with vectors, force on electron. The line of electrons being sprayed off of the antenna that then cause the receiver electron to move. The path that an electron will follow due to the electromagnetic wave. The evenly spaced electrons moving up and down between the two antennae. The field of negative charges which are moving through space. The strength and direction of the force that would be exerted by the electromagnetic wave on an electron. (b) Display the full field. Force or field vectors are displayed on the points of a square grid. With the frequency set at the mid-point of the slider and the amplitude set at the mid-point of the slider, estimate the wavelength of the wave in units of grid spacins d. Use the pause button and step button in order to get a good measurement, and round to the nearest integer. Remember that from one node to the next is one half wavelength. What is your estimate of the wavelength in units of grid spacings? (c) In the simulation, if you increase the amplitude of the oscillations, what happens to the wavelength? (d) Use the simulation to decide which of the following statements is true. If the oscillation frequency of the transmitting electron decreases, the oscillation frequency of the electron in the receiver is instantaneously affected. The electron in the receiving antenna oscillates at a lower frequency than the electron in the transmitting antenna because of the distance between the antennas. If the frequency of oscillation increases but the amplitude of the electron oscillation remains the same, then the electron in the transmitting antenna is experiencing larger accelerations. If the amplitude increases but the frequency remains the same, the electron at the receiving antenna experiences larger peak forces but oscillates at the same frequency as before. If the frequency of the transmitting electron decreases by a factor of two, it will now take longer for the electromagnetic signal to reach the receiving antenna. If the frequency decreases, the wavelength decreases. The electromagnetic waves generated by the transmitting antenna produce currents in the receiving antenna. When the electron in the transmitting antenna is at its peak height, the electron in the receiving antenna is always also at its peak height. 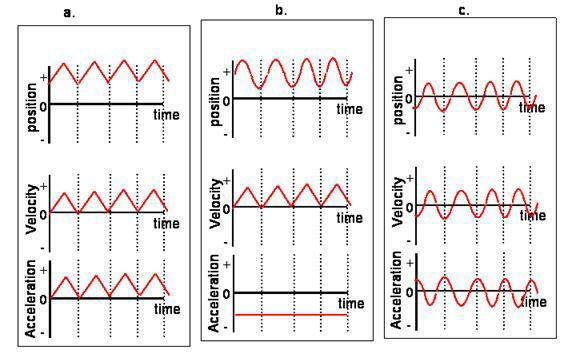 (e) Which one of the following sets of graphs of position vs. time, velocity vs. time, and acceleration vs. time describes the motion of the electron in the receiving antenna? Dark fringes in the diffraction pattern of a single slit are found at angles θ for which w sinθ = mλ, where m is an integer, m = 1, 2, 3, ... . Assume light from a distant source passes through a narrow slit as shown on the figure on the right. Let the polarization be perpendicular to the plane of the figure. What do we observe on a distant screen? dE = (Asds/r)cos(kr - ωt). dE(y) = (Asds/r0)cos(kr0 - ωt). Here As/r0 is the amplitude per unit width and ds is the infinitely small width of a point source. For off-axis points for which s ≠ 0, the distance is longer or shorter than r0 by an amount Δ.
dE(y) = (Asds/(r0 + Δ(s))) cos(k(r0 + Δ(s)) - ωt). To find the total amplitude E(y) we have to add up the contributions from all points on the aperture. Because there are an infinite number of points, the sum becomes an integral. E(y) = ∫-a/2+a/2(A/(r0 + Δ(s)))cos(k(r0 + Δ(s)) - ωt)ds. E(y) = (As/r0)∫-a/2+a/2cos[(ksinθ)s + (kr0 - ωt)]ds. E(y) = (As/r0)cos(kr0 - ωt)(sin(ka(sinθ)/2)/(ka(sinθ)/2). E(y) = (As/r0)cos(kr0 - ωt)(sin(πa(sinθ)/λ)/(πa(sinθ)/λ). The function sin(x)/x = sinc(x) is called the sinc function. In Excel, produce a plot of sin(x)/x vs x for -4π < x < 4π. Label the axes and paste the plot into a Word document. where <I0> is the average intensity at the center. The time-averaged intensity has a peak in the center with smaller fringes on the sides. For small angles we may approximate sinθ ~ θ. Then the first zeros on the sides of the central peak occur when πasinθ/λ ~ πaθ/λ = π, or θ = λ/a. In Excel, produce a plot of <I(y)>/<I0> = sin2(πa(sinθ)/λ)/(πa(sinθ)/λ)2 versus πa(sinθ)/λ, for -4π < πa(sinθ)/λ < 4π. In other words, set x = πa(sinθ)/λ, and produce a plot of <I(y)>/<I0> = sin2(x)/x2 versus x, for -4π < x < 4π. Label the x-axis with πa(sinθ)/λ instead of x. Paste the plot into a Word document. Describe the main feature of the Fraunhofer diffraction pattern. If λ = 500 nm, and you want to observe the diffraction patter you have plotted have a width of ~±2 cm a distance L = 1 m away from the slits, what is a reasonable slit width? Assume light shines on a series of equally spaced slits. The spacing between the slits is d. The diffraction pattern is observed on a screen a distance L away from the slits, L >> d.
the electric fields E(x,t) = Emaxcos(kx - ωt + φ) of all the sources are in phase. δ = k d sinθ = (2πd/λ) sinθ. where α is the phase of the electric field of source one at position z on the screen and N is the number of sources. E2 = Emax2[(∑n = 0N-1cos(nδ))2 + (∑n = 0N-1sin(nδ))2]. I(δ) = E2/Emax2 = (∑n = 0N-1cos(nδ))2 + (∑n = 0N-1sin(nδ))2. In Excel produce a plot of I(δ) versus δ for up to four sources. Let column A contain the phase shift δ, from -14 to +14 ins steps of 0.1, starting in row 3. Let columns B, C, D, and E contain a*cos(0), b*cos(δ), c*cos(2δ), and d*cos(3δ), respectively, starting in row 3. The coefficients a, b, c, and d in row 2 are used to turn a source on or off. If a coefficient is 1 the source is turned on and if it is zero a source is turned off. Start with a = b = 1, c = d = 0. Let column F contain the sum of columns B through E, starting in row 3. Let columns G, H, I, and J contain a*sin(0), b*sin(δ), c*sin(2δ), and d*sin(3δ), respectively, starting in row 3. Let column K contain the sum of columns G through J, starting in row 3. Let column L contain the square of column F plus the square of column K, starting in row 3. Column L contains the intensity distribution I(δ) as a function of δ, starting in row 3. Construct a plot of the intensity distribution as a function of δ (column L versus column A). Label the axes. With a = b = 1 and c = d = 0 the plot shows the intensity distribution of two sources. Copy your plot to a Microsoft Word document. For a single source the intensity is normalized to one. What is the intensity of the central maximum for two sources? Turn on another source by setting c = 1. Copy your plot of the intensity distribution as a function of d for three sources to a Microsoft Word document. What is the intensity of the central maximum for three sources? Turn on another source by setting d = 1. Copy your plot of the intensity distribution as a function of d for four sources to a Microsoft Word document. What is the intensity of the central maximum for four sources? In your own words, describe how the intensity distribution changes, as you add more equally-spaced sources. Insert your log with the answers to the questions in blue font.